When I think of mulled wine, I think of my daughter and I visiting my other daughter in December of 2010 in London. Everything was Christmassy, and it was cold, as expected. The first thing she did when we met up at her flat was to prepare mulled wine. It was so charming and thoughtful. But I had no idea that mulled wine is so popular in London, at least during the cold months I presume. In fact, every single pub we visited, which was daily, served mulled wine. Here is a special photo of us three gals at The Marylebone, after warming our spirits with mulled wine. Those memories, of the beautiful quaint pubs, the Christmas markets, the mulled wine, fabulous meals, but mostly of being with my two daughters at a special time of year, were so important to me, that once home, I haven’t wanted to make mulled wine. I needed to preserve those memories some how. Until now. Out of curiosity, I sought out recipes for mulled wine online, and they’re basically all straight forward. In fact, you can simply mull wine with purchased mulling spices! If you don’t know, the act of mulling is simmering or steeping the wine or cider. I found a recipe on Epicurious along with a blurb written by Katherine Sachs that offered a bit more information when proceeding with mulled wine, with more options. For a stronger pot, add some liquor, such as brandy or spiced rum. Mulled wine can also be made with white wine, such as a Riesling or Grüner Veltliner, if you prefer that style. Pour the wine, cider, and port into an enamel pot. Add the orange rinds, cinnamon sticks, cloves, and allspice. Start heating slowly on a low-to-medium setting. You want to steep the wine, not boil or reduce it. After about 30-40 minutes it will be done. Sieve the mixture if you don’t want the little spice bits. Serve in cups with a cinnamon stick, star anise, and slices of orange. I purposely didn’t shake the bottle of apple cider. I didn’t want the mulled wine to look murky. This is especially important if you chose to serve the mulled wine in a glass cup. You want it pretty and burgundy, not brown and murky. The mulled wine would work well in a carafe, so you don’t have to keep it on the stove. Just serve! I have prepared mulled port before and that is slightly sweeter than mulled wine, but definitely still warming and flavorful. It was mulled with clementines. I happen to love beets. But I didn’t always. When I first tasted them, they tasted like dirt to me. Not that I really know what dirt tastes like, mind you. But they have a real earthiness to them that you almost have to force yourself to embrace, sort of like learning to love beer. There’s nothing quite like the simplicity of roasted beets. They’re sweet and tender. But today I roasted them and then glazed them, with spectacular results. 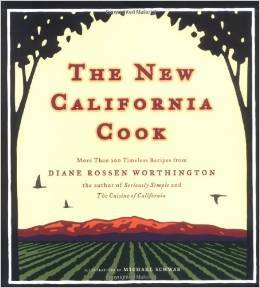 The original recipe is from a cookbook called The New California Cook, by Diane Rossen Worthington, published in 2006. The recipe for orange-glazed beets caught my attention because as I said, I love beets. I’ve roasted them, and pickled them, but never glazed them, so I knew I had to try this. It’s a little more involved recipe, because I made it a little more difficult by adding an extra step. 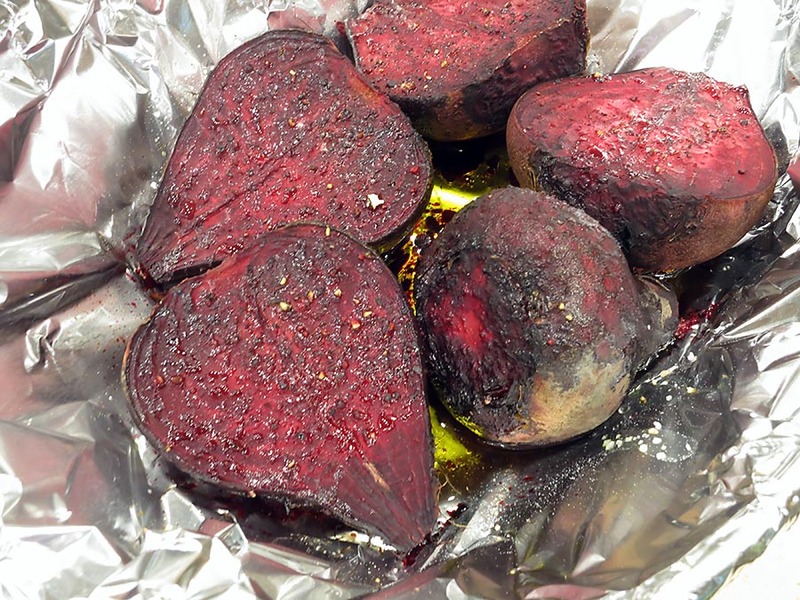 I wanted to roast the beets first, which after-the-fact, didn’t really make a difference. Preheat the oven to 400 degrees. Cut off the stems of the beets. 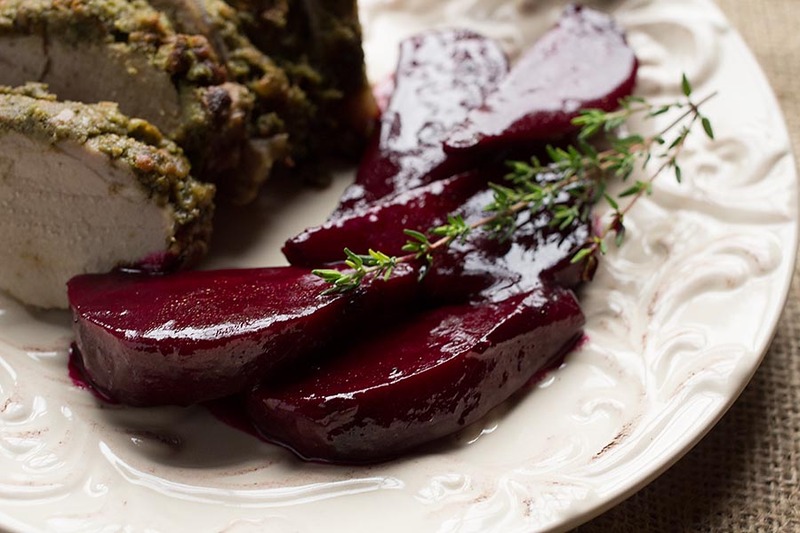 Place the beets in a foil-lined roasting pan. 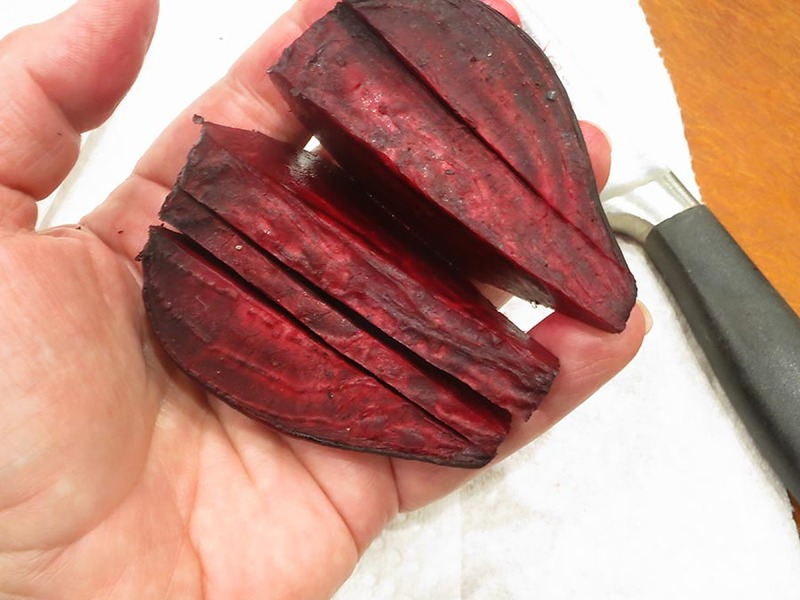 Two of the beets were larger than the third, so I sliced them in half, to make them more uniform in size. Drizzle them with a little olive oil, about 3 tablespoons. Season with salt and pepper. 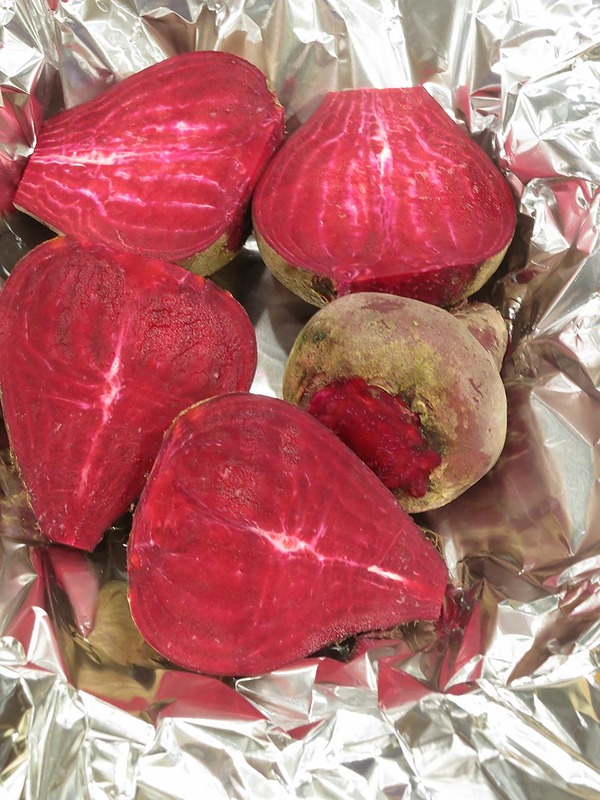 Cover the whole baking dish with foil, and bake the beets for about 30 minutes. 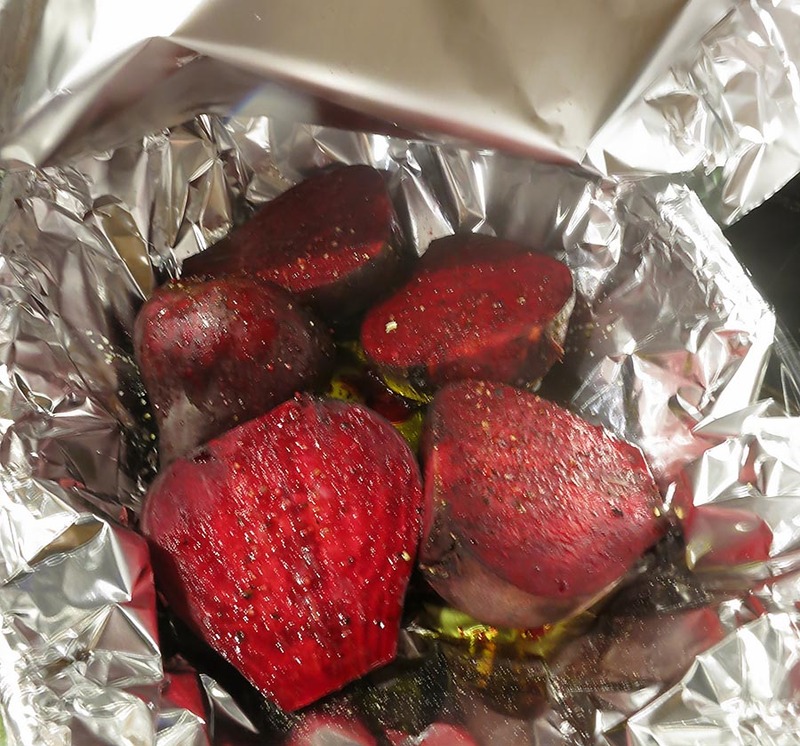 Remove the foil and roast the beets for 15-20 minutes. They’re not completely tender at this point, but I didn’t want them cooked thoroughly before I went through the glazing process, which cooks the beets further. 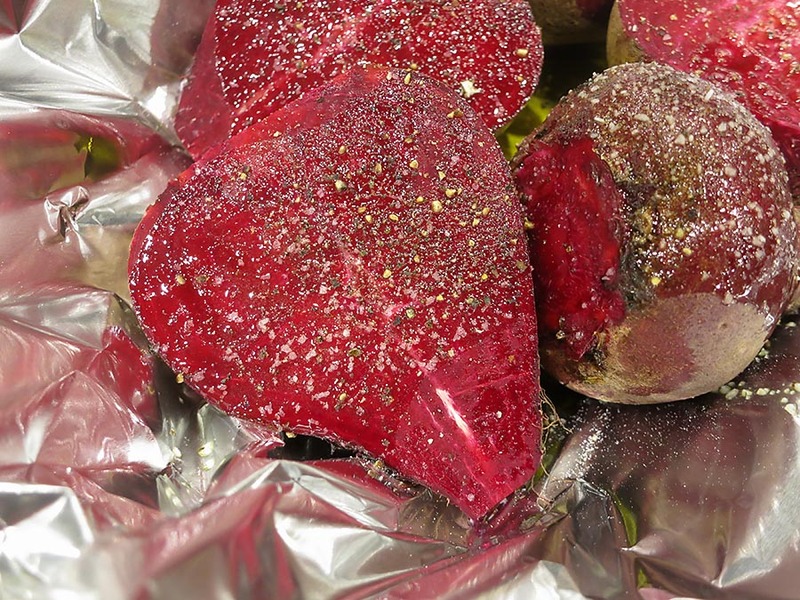 Remove the beets from the oven and let them cool. Meanwhile, combine the chicken stock, orange juice and balsamic vinegar in a saucepan. 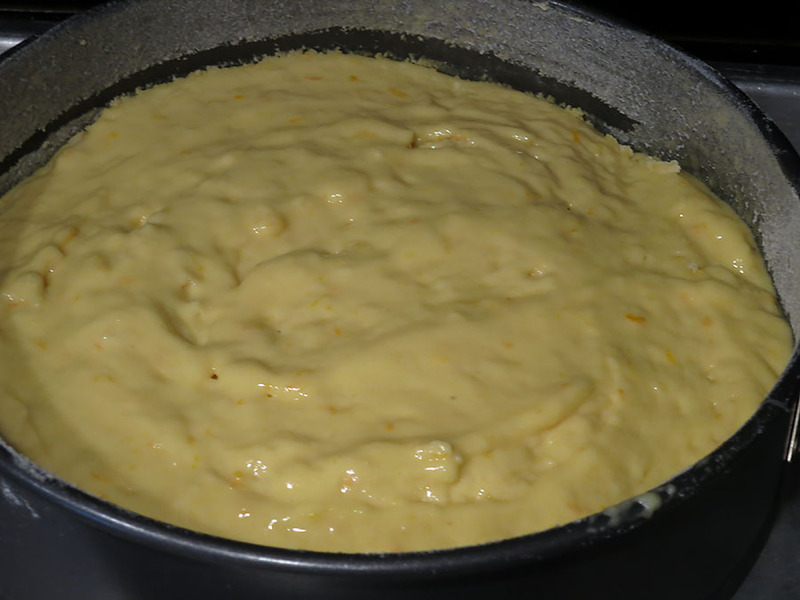 Bring the mixture to a light boil, and let reduce for about 15 minutes or so. 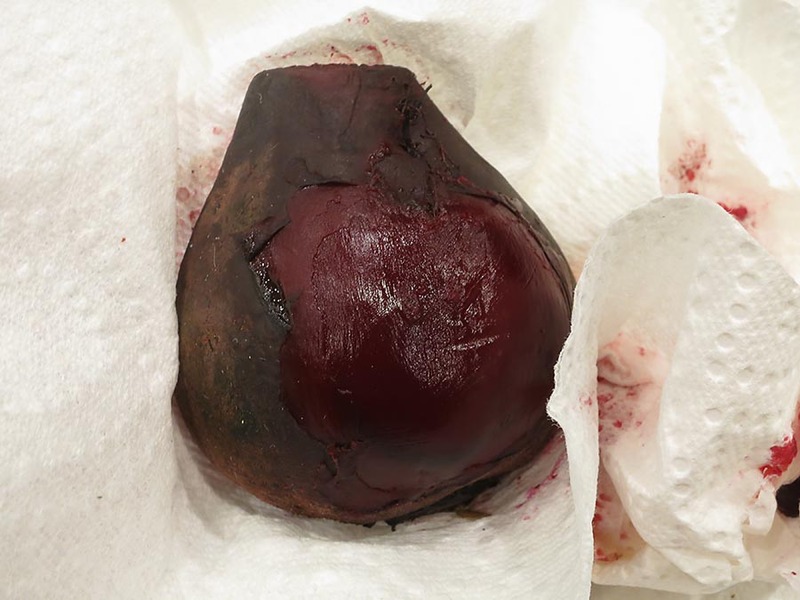 When the beets are cool enough to handle, remove the peels. I do this by rubbing the skins with paper towels. If all of the peel won’t come off, finish with a peeler. Some people wear gloves handling beets, because your fingers will turn red. But it’s not permanent. Slice the beets into lengthwise wedges or, if you prefer, horizontal slices. It depends what shape you want. 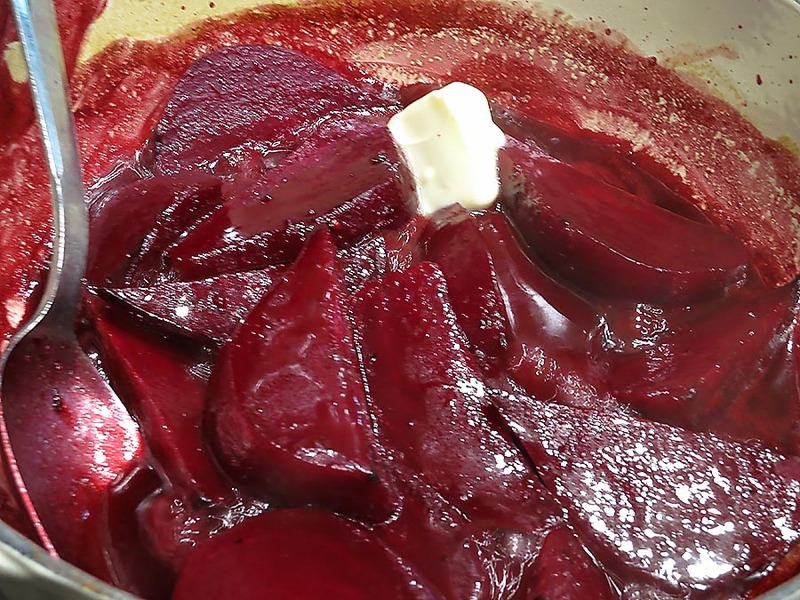 Place the beets into the liquid and maintain a soft simmer. Pour all of the remaining liquid from the roasted beets into the saucepan. 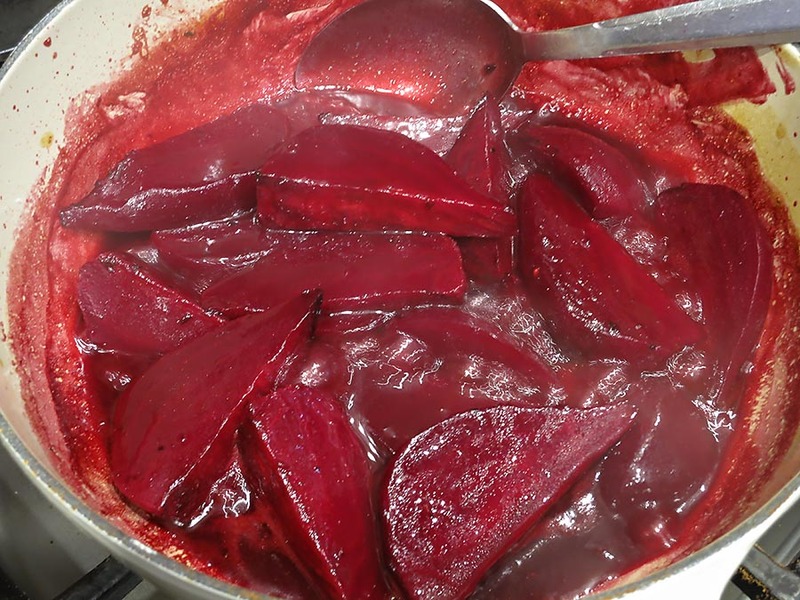 Continue simmering, occasionally spooning the liquid over the beets, if they are not completely submerged. The liquid will reduce and become a glaze. Add the butter, stir in, then remove the saucepan from the stove. The original recipe calls for added chopped parsley, but I omitted that. You can taste for salt. These beets are a lovely side dish. Today I paired them with a pesto-crusted pork tenderloin, and it was a perfect combination. The beets would also be lovely on a composed salad. verdict: Delicious! As I mentioned, I don’t think the roasting step improved the beets ultimate flavor and texture, so that step can easily be omitted. Simply peel and chop/slice the beets, and simmer them in liquid. 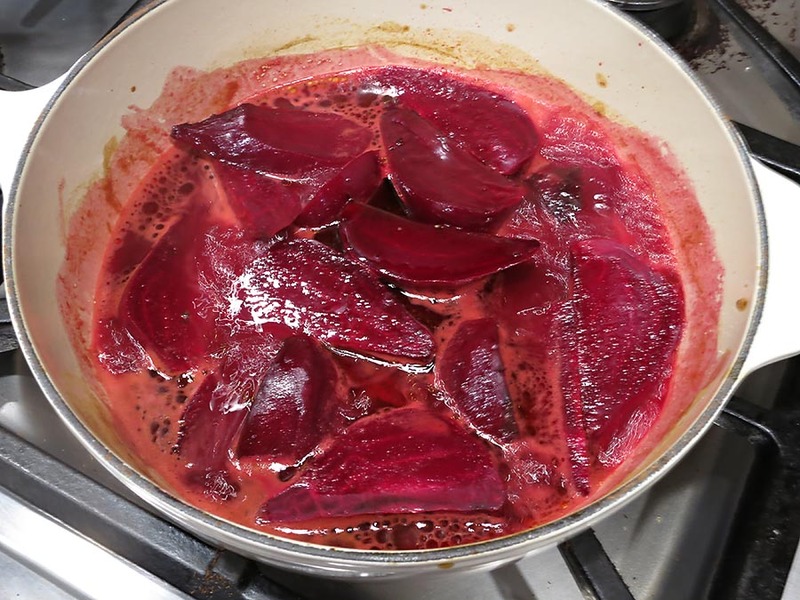 You will have to double up on the liquid ingredients, however, since the whole process will take about 45 minutes before the raw beets become tender. note: I will make these beets again in the fall, with some apple cider and maple syrup. They really are fabulous glazed! 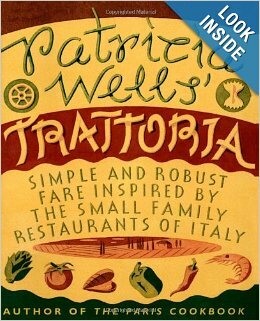 I never really wanted to like Patricia Wells, probably because her life is so enviable. She never owned a restaurant or worked as a chef. In fact, she started out as a food journalist, but fell in love with the foods of France, then Italy, and then wrote about them. 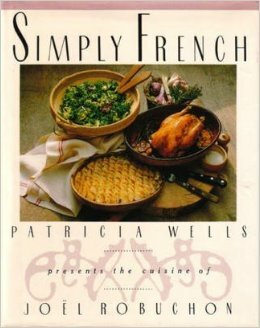 It’s not like she’s a Hubert Keller or Eric Ripert, but boy has she published a lot of cookbooks. And I have to say, all of the ones I own are pretty fabulous. I heard her speak at a demonstration at an Aspen Food and Wine festival many moons ago. She seemed really snobby. I think she’s been living in France too long, with homes in both Paris and Provence. 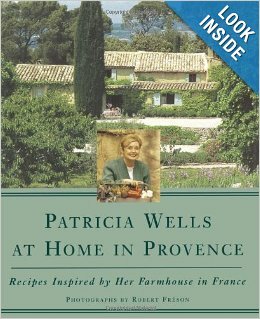 One of Ms. Wells’ cookbooks that I own is about her home in Provence. I really didn’t want to like this book, because it showed off her beautiful 18th century stone farmhouse, and to-die-for kitchen. With a wood-fired oven. It will make you so jealous that you don’t have a farmhouse in Provence. Unless you do. And then there’s this book she wrote featuring Joel Rebouchon and his recipes. It’s another beautiful cookbook that I refer to often. 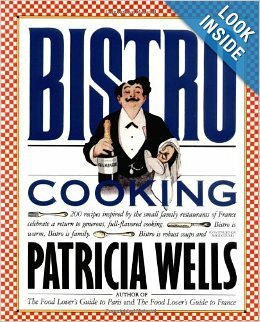 Then there’s her Bistro book, which is essentially the French version of the Trattoria cookbook, focusing on regional food prepared at neighborhood restaurants throughout France. But I love her Trattoria cookbook because it’s about simple Italian fare; the recipes aren’t pretentious. It’s all about “healthy, simple, robust fare inspired by the small family restaurants of Italy.” Thus, the title. Speaking of trattorias, if you ever go to Italy, be prepared that there are many different kinds of eating and dining establishments there. And each one has limited menus are are only open at specific times. Make sure to look into this before you go, or you will end up at at what you thought was a restaurant, where no food is available, or at a bar with no drinks. Or, the establishment will be closed. Some of the recipes in Trattoria might not be terribly inspiring to those expertly familiar with Italian cuisine, but the book certainly has its place, especially to home cooks like myself. 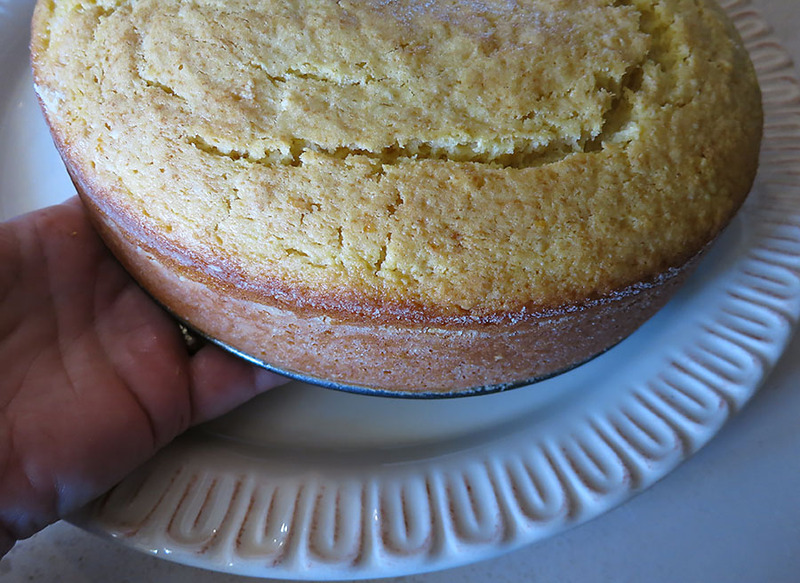 There are many recipes in it to which I still use, like this cake, which is Tuscan in origin, according to Ms. Wells. Here’s her website, in case you want to check her out. She’s really quite accomplished. I’m just a little jealous of her life! Evenly coat the interior of a 9″ springform pan with butter. Dust lightly with flour, shaking out the excess flour. Set aside. 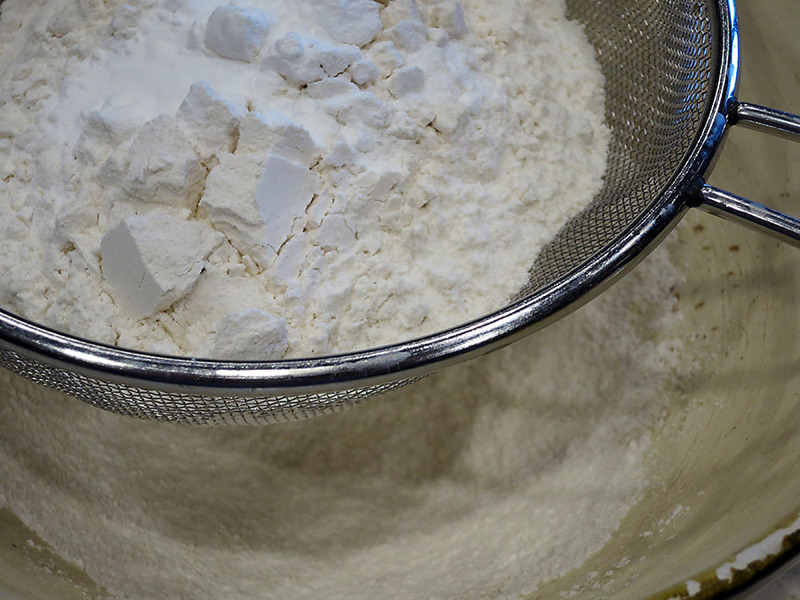 Sift the flour, baking powder, baking soda and salt into a large bowl. 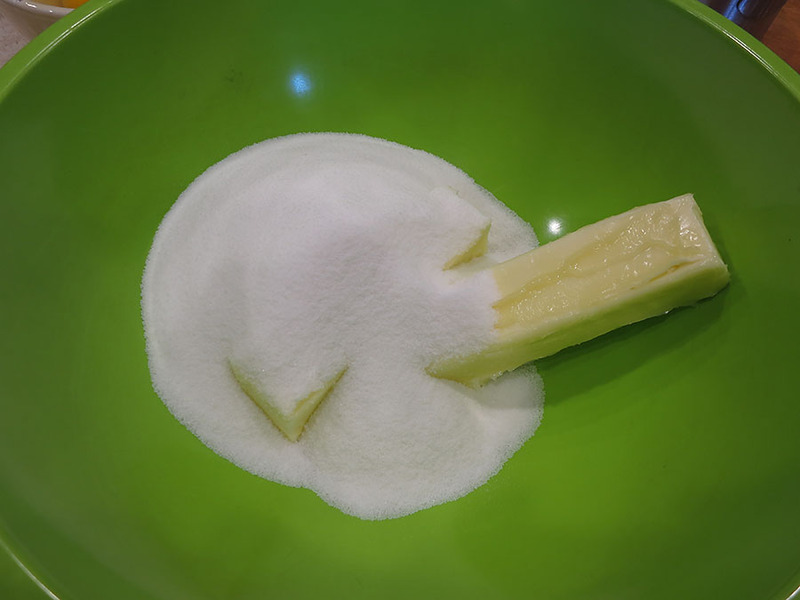 Place the softened butter and sugar in a large bowl. 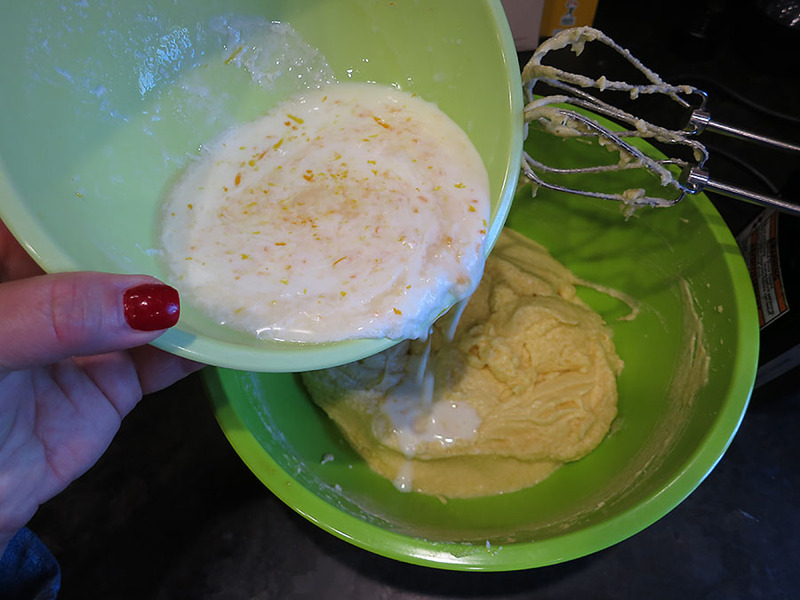 Using an electric mixer, beat the butter and sugar until light and fluffy, about two minutes. 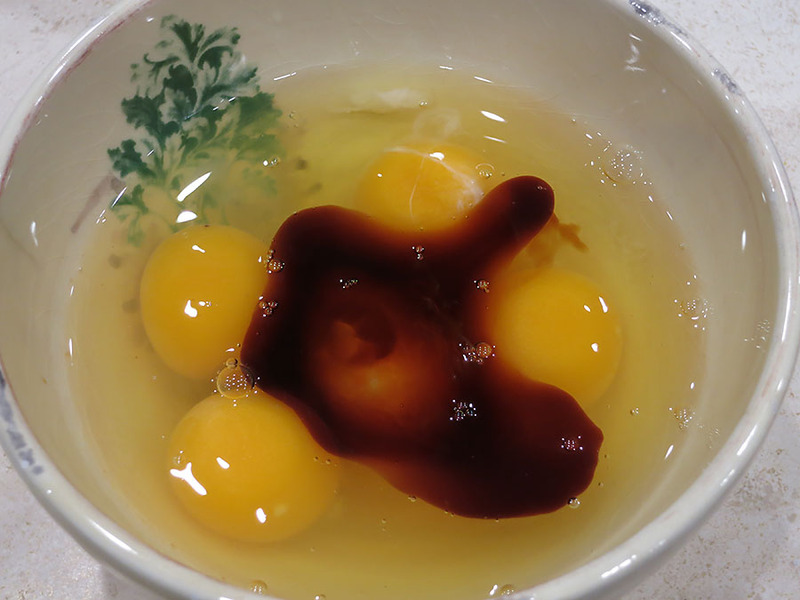 Crack each egg individually and place in a small bowl to avoid shells. Add the vanilla extract to the eggs. 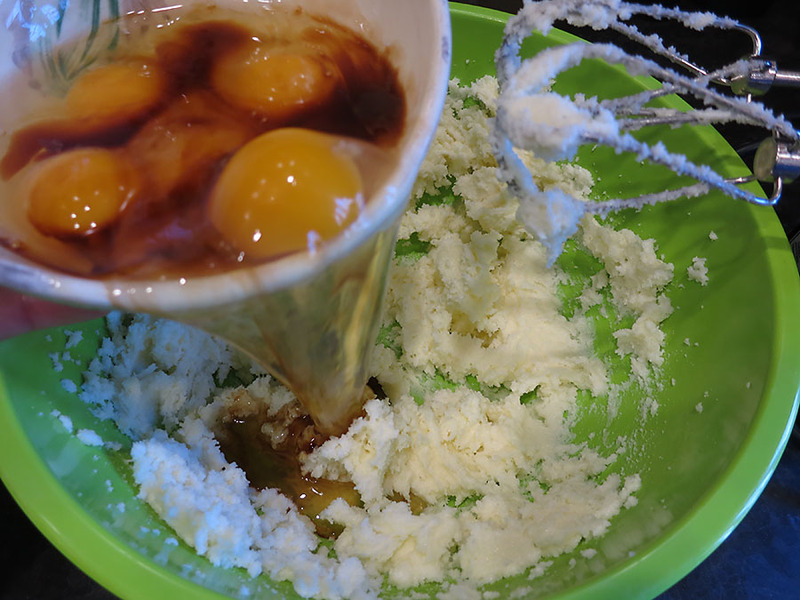 While beating, add one egg at a time, beating well after each addition. Continue until the eggs are all gone. 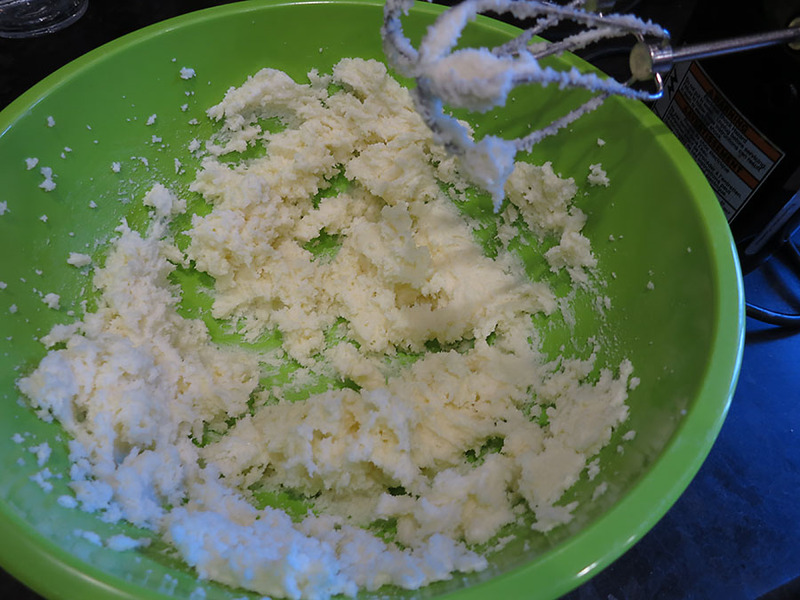 Then beat in about 1/3 of curdled milk mixture and then 1/3 of the sifted dry ingredients, alternating and just beating until smooth. 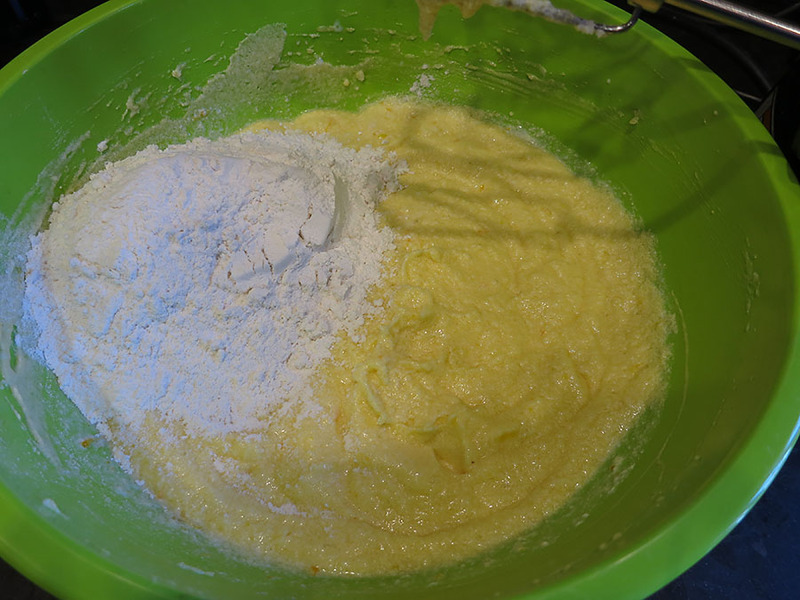 The batter will be nice and smooth at this point. 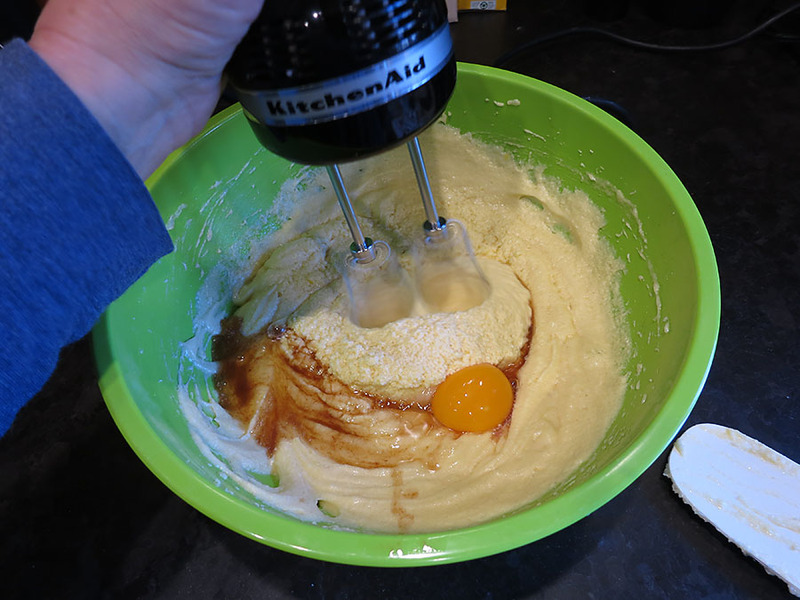 Bake for approximately 50 minutes; a cake tester should come out clean when inserted in the middle of the cake. 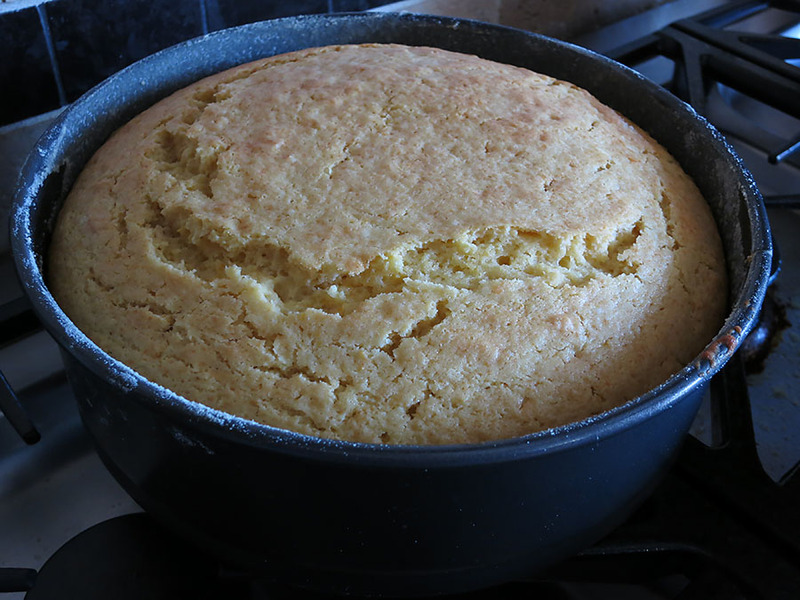 Remove the side of the pan, and let the cake cool for about 30 minutes. Then remove the bottom of the springform pan using a long knife held parallel to the bottom. Slice the cake in wedges when still warm, or at room temperature. 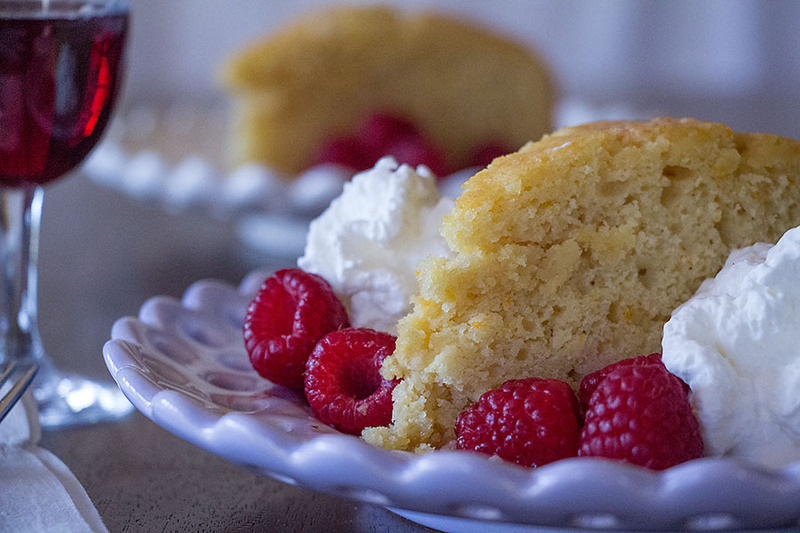 I served mine with raspberries and slightly sweetened whipped cream. 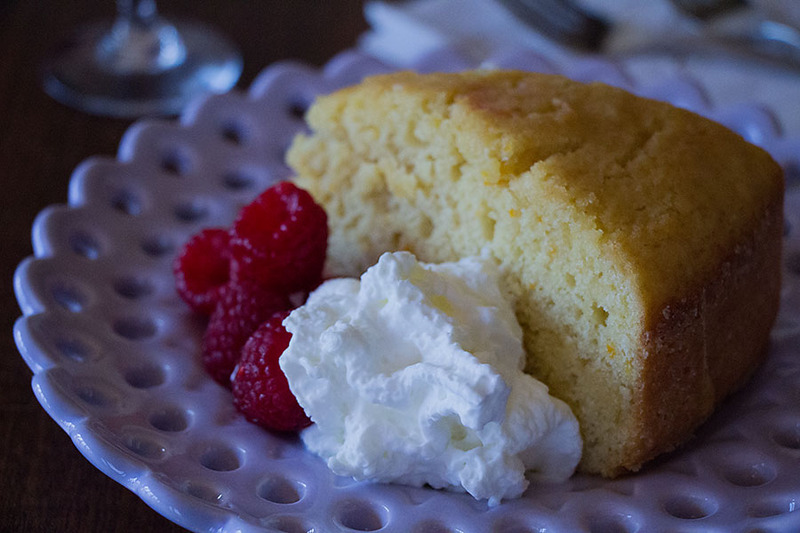 I also served this cake with Quady Red Electra, which is a red Moscato. 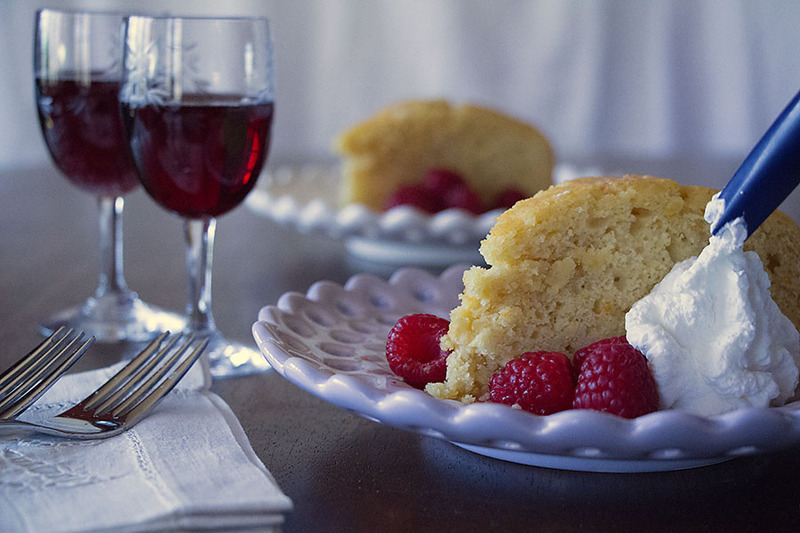 It’s wonderful with desserts, but also perfect to sweeten sangria. But an Auslese, a port, sherry, or some Tuscan Vin Santo would pair nicely as well. This cake is just as delicious as I remember it from the last time I made it about ten years ago. It’s not a dry cake, presuming it’s not overcooked. It’s dense, in fact, and has an interesting crumb to it. I could have sprinkled the cake with some confectioner’s sugar as well, but I like the fact that this cake has no icing, and doesn’t need any. It would also be fabulous for breakfast or brunch. note: There are two major differences between this recipe and the original one from the cookbook. First of all, Ms. Wells uses a 10″ Bundt pan for this recipe, cooking it at 350 degrees for 45 to 55 minutes. Also, she uses vanilla sugar instead of white sugar – sugar in which a vanilla bean pod has been added. I simply added vanilla extract to the recipe. 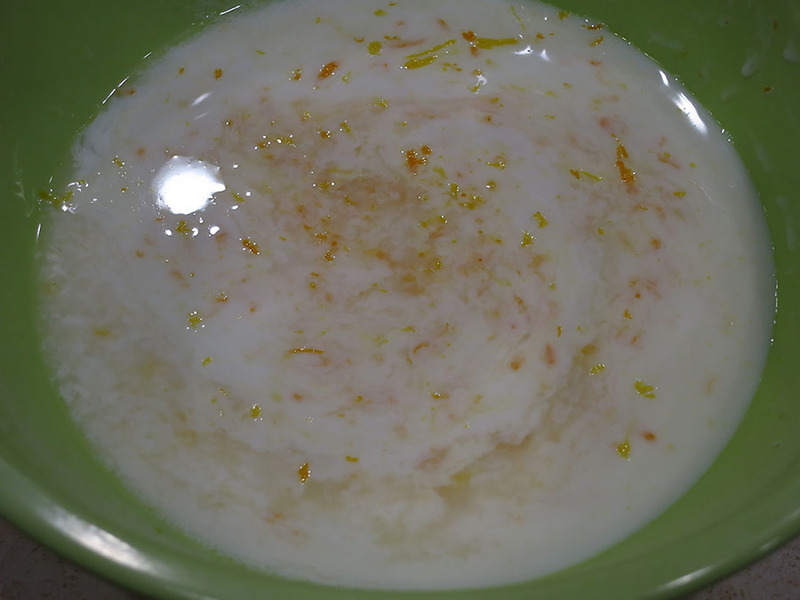 Buttermilk could probably be substituted for the milk in this recipe, given the additions of lemon and orange juices, but I really like the idea of the milk mixing with the juices and zest for a time before being used in the recipe. 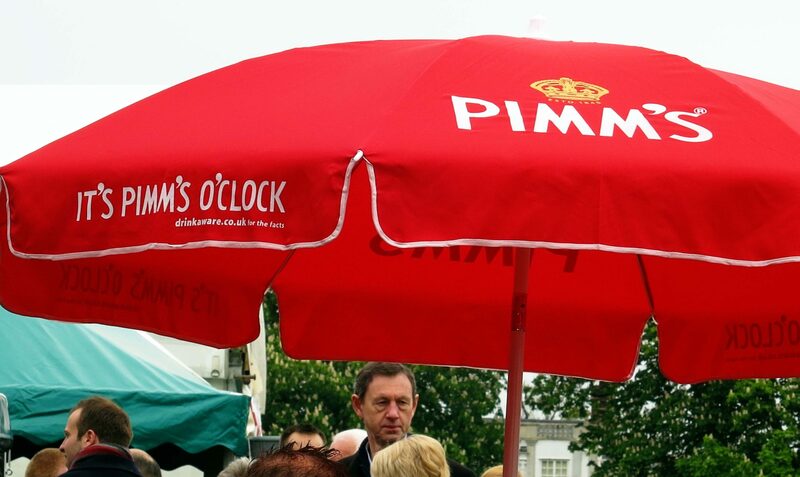 I remember the first time I had Pimm’s, in 1978. I wasn’t much of a drinker way back then, but I remember it being so unique. I had no idea it even had a British origin – I just enjoyed the flavor! Fast forward 25 years to when my older daughter visited a girlfriend in London, and they shared a pitcher of Pimm’s at a pub! I was so excited, because I’d forgotten all about it, and certainly had no knowledge of its national esteem. 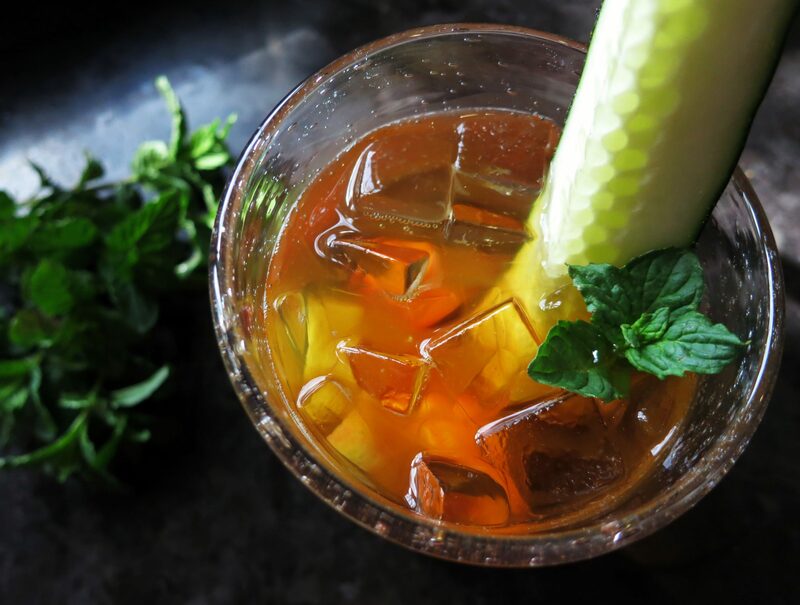 The origin of Pimm’s is very interesting, dating back to the 1800’s when Mr. Pimm invented the gin-based drink. There was originally Pimm’s No. 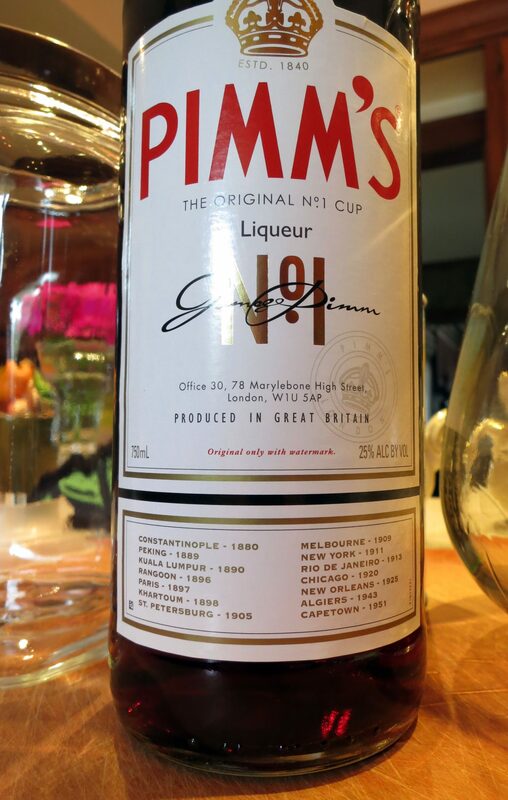 1, as it is now, but there were also five subsequent Pimm’s; most all of these have been phased out. I didn’t even know this when I snapped this photo at the Hampton Court food fair outside of London. I was with number 2 daughter and it was freezing out. But by golly there was Pimm’s being sold and I needed to have an official one! It was indeed delicious, although not perfect for a chilly day. 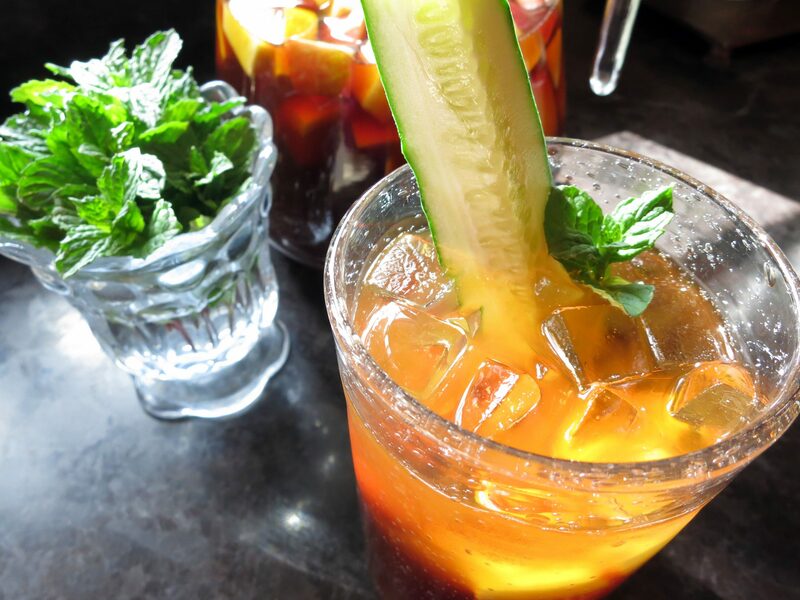 However, Pimm’s is perfect for spring and summer when it’s acting like spring and summer. Because it’s so refreshing, I often make pitchers of it or put it in a large dispenser. It goes with just about any kind of cuisine. 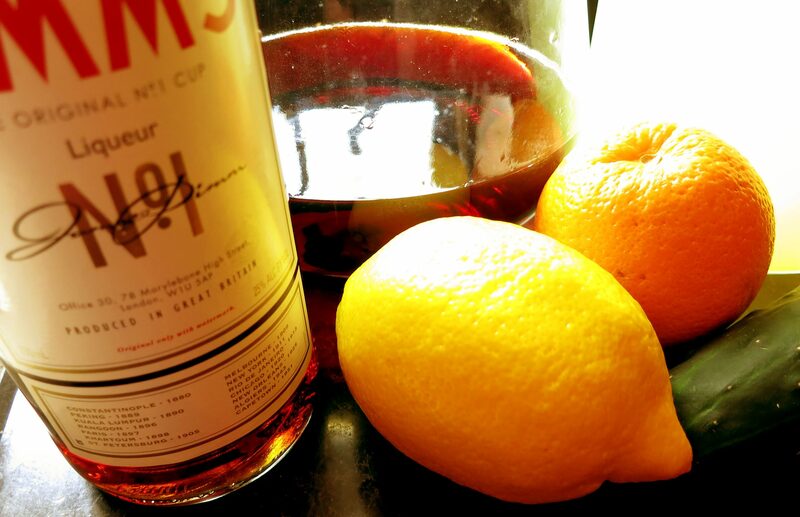 Here is the “official” recipe for Pimm’s, also referred to as Pimm’s cup. with 3 parts chilled lemonade. In a large pitcher, pour in the seltzer, lemonade and Pimm’s. Stir to combine. Pour mixture into prepared glasses and enjoy! This recipe comes from the website Anyone for Pimm’s. If you noticed, there’s no mention of how much seltzer to use, unless British lemonade is bubbly, but I don’t think it is. In one tall glass, place 1 part Pimm’s, 1 part lemonade and 2 parts fresca. Add a generous amount of ice, and stir well. Add some pieces of cut up orange, apple, and strawberry. 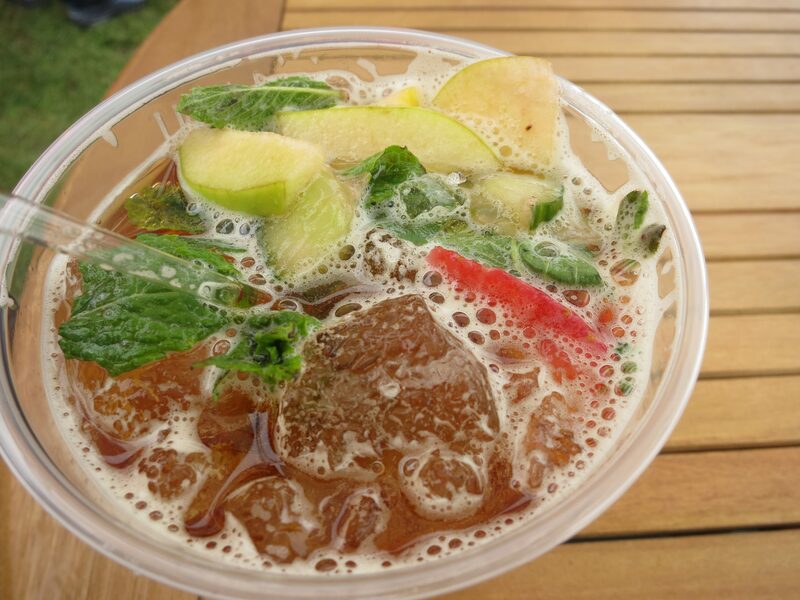 At the food fair, I could definitely taste mint and cucumber in my Pimm’s. It was completely enjoyable, but I don’t like my Pimm’s to taste too much like water you get at the spa, so I leave out the cucumber. However, I do use a long piece of cucumber that helps with stirring. But you try it however you like. 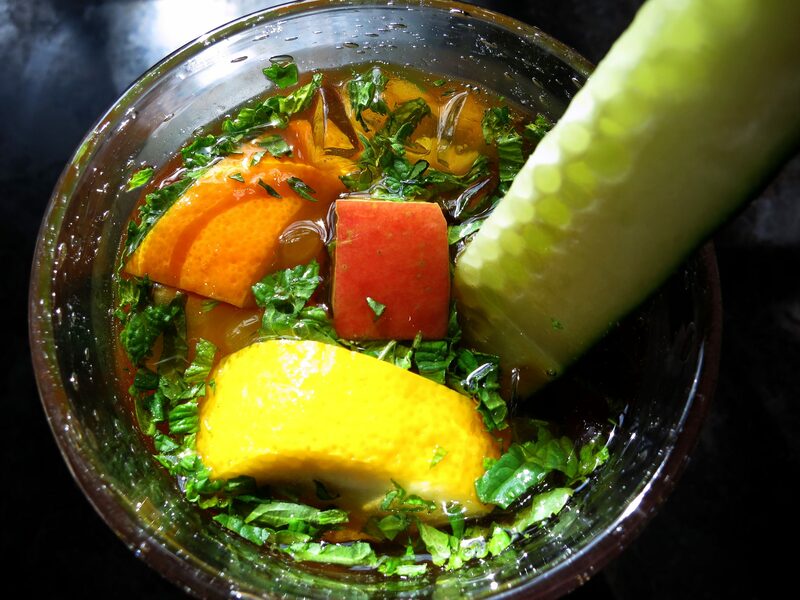 When I make Pimm’s in a pitcher, I add a whole array of sliced fruits because it’s so pretty! And you can muddle a bunch of mint leaves if you like, before finishing with the recipe. I love the mintiness, but I don’t like having to deal with chopped mint in my teeth. A personal preference, again. note: Pimm’s is a strong drink, but it should not be cloyingly sweet. The secret, from years of personal experimentation, is the Fresca. The drink should be bubbly, not taste like a liqueur on ice. If you prefer using seltzer water, or can’t get your hands on Fresca, be as generous with that. It lightens the drink without adding sweetness, which it doesn’t need. Enjoy!